From Northern Trust: The signs of the new year are readily apparent. Lines at the salad bar are longer and lines at the burger station are shorter. More commuters are reading books and fewer are playing games on their phones. The bathroom shared by my children looks sanitary for a change. I hope these outcomes, reflecting resolutions for 2017, prove to be lasting. Countries don’t usually make new year’s resolutions. But if they did, China might have aimed to have a better January than it did in 2016. China suffered the twin indignities of a currency correction and an equity correction on the first trading day of last year. Fortunately, order was restored and investor attention turned to other global developments. Unfortunately, China’s challenges have resurfaced. Its currency is under renewed pressure and trade relations with the United States promise to become more complicated. The potential for instability in the world’s second-largest economy remains a significant global risk. China’s travails began to escalate last summer when long-term U.S. interest rates started to rise and the U.S. dollar appreciated. 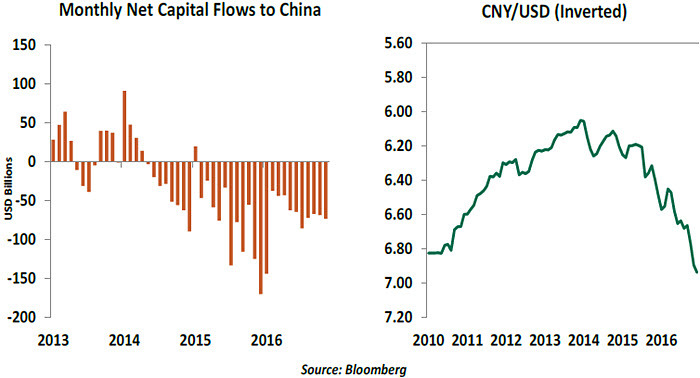 That kindled additional capital flight out of China as investors (domestic and foreign) sought better returns. In turn, the shift placed more pressure on the Chinese currency, extending a vicious circle. Chinese authorities have reacted with traditional measures. Capital controls have been tightened to keep money from leaving the country. The currency has been defended with the generous application of official reserves. And economic activity has been stimulated with direct government investment in state-run enterprises. While effective in the short term, these steps run counter to China’s stated long-term objectives of placing its currency value and its economic direction in the hands of markets. Further, China’s official reserves, while still substantial, have declined by 25% in a little over a year. The excess of debt growth over gross domestic product (GDP) growth has attracted concern from the International Monetary Fund, among others. Financial imbalances in China have grown to dangerous levels. Bad debt on bank balance sheets will need to be reckoned with, which will place another call on the country’s reserves. Shadow banking products are widely held by retail investors; a reversal of fortune in equity or property markets could trigger a panic. The U.S. presidential election may serve to complicate China’s efforts to sustain stability. The president-elect has taken a much tougher public tone on China, and backed it with the appointments of Robert Lighthizer as U.S. trade representative and Peter Navarro as a special advisor on trade and industrial policy. Both are both China skeptics. Concerns about U.S. trade relations with China are hardly new. As the merchandise trade deficit between the two has grown, there have been persistent claims that the playing field for manufacturing is not level between the two countries. Chinese companies generally receive more subsidies and face fewer labor and environmental restrictions. fThe theft of intellectual property has been a frequent sticking point. While the recent decline of the renminbi seems consistent with market forces, its past weakness was… manufactured. 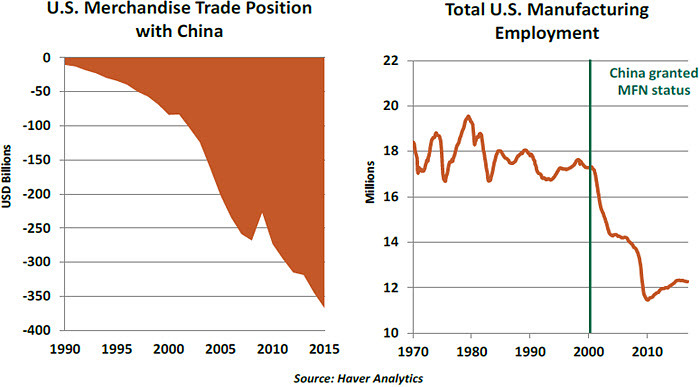 We’ve argued that technology is the main driver behind the decline in U.S. manufacturing employment, but the pace of manufacturing job loss accelerated when the U.S. granted China permanent most favored nation status in 2000. The hope has always been that the ability of the U.S. to sell into China would expand as the country developed, and it has. But American producers still face challenges as they try to get a foothold. Exports to China have grown by 240% since 1990, but imports from China have grown by 317%. There are a series of things the incoming administration might attempt to square accounts. U.S. presidents have fairly broad latitude to implement tariffs without the consent of Congress. The new Treasury secretary could turn up the temperature by declaring China a currency manipulator in its April 2017 report on foreign exchange practices. Of course, China would not sit still if America takes a more confrontational tone. China could make life more unpleasant for U.S. exporters. It could shift reserve holdings away from U.S. Treasuries. It could become even more aggressive in its aspirations in the South China Sea and less aggressive in its efforts to check North Korea. Making moves in this economic and diplomatic game of chess will require thinking several moves ahead. It bears noting that if a punitive U.S. trade policy sends China into a hard landing, which might carry over to the rest of Asia, it would be a terrible economic outcome for the West. China is in the midst of a series of delicate economic transitions: from manufacturing to services, from exports to domestic consumption, from a managed system to a market system and from a very young country to a much older one. It is in the global interest to see these transitions completed successfully. China’s ability to retaliate with force may ultimately check the protectionist groundswell in the U.S. If harsh rhetoric gives way to cool reason, the adjusted equilibrium would still allow the broad benefits of free trade to accrue to both countries. The lesson learned in Washington might lead to more productive trade discussions with other nations, Mexico chief among them. The upcoming Chinese lunar new year will herald the start of the year of the rooster. Hopefully, the new dawn that will be celebrated later this month will lead to a prosperous new day for relations between the United States and China. 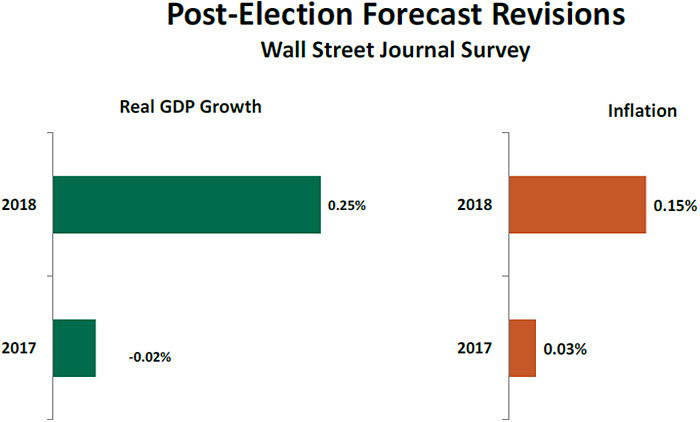 On the eve of the presidential election, the consensus forecast for the American economy was one of modest growth. Most polls placed the odds of a Trump victory as quite low; its occurrence, many said, could cause severe damage to markets and the outlook for the U.S. This forecast was incorrect. Following the unexpected Trump victory, equity markets scaled new heights. Readings on business conditions have improved; the National Federation of Independent Business reported a sharp increase in its business optimism index in its December 2016 report. Some have highlighted the benefit of favorable “animal spirits” to the outlook. Post-election economic surveys show an upward revision of growth forecasts. The Blue Chip Economic Indicators survey of December notes “somewhat greater optimism” about the performance of the economy in 2017. As a result of the election outcome, slightly more than 47% of the survey participants said they have raised their forecasts for real GDP growth in 2017 and 44% noted they had raised their inflation forecasts. And the results of the November 2016 Wall Strefet Journal Economic Forecasting survey (conducted after the election) pointed to higher growth and inflation than did the survey results of the previous month. First, any increase in aggregate demand will occur at a time when the labor market is near full employment and wages are accelerating. If the expansionary policies are enacted, the Fed could be raising interest rates sooner and faster than current expectations. Second, there could be strong opposition among some Republicans to cast aside the party’s traditional position of fiscal austerity and pay for the stimulus with debt. Third, concerns about igniting an international trade war could persuade some members of Congress to vote against protectionist policies. Fourth, higher interest rates and a stronger dollar could result in headwinds via lower housing sector activity and a reduction of exports. Fifth, a lower corporate tax rate need not necessarily result in higher investment spending. Firms could engage in equity buybacks and pay higher dividends instead. Market participants have focused on the forest of campaign promises. But the trees matter, and precise details of economic policies, the legislative process and the lag between passage and implementation are factors to consider as forecasts are updated. The equity markets are looking forward to a much brighter future than they did prior to the election, but economists’ revisions to GDP forecasts have been small. The difference between economic growth and profit growth may explain some of the divergence; profits will rise faster if there is a reduction in corporate income taxes. But there may also be a difference of opinion between economists and investors on how much the new administration can actually deliver. Economists often turn out on the wrong side of these “disagreements,” so this isn’t necessarily a cause for market concern. But details of the policy changes are critical to the economic outlook. As these details become clearer, forecasts and asset prices remain ripe for revision. Few pieces of economic legislation have generated more controversy than the Affordable Care Act (ACA). Its proponents point to expanded coverage, especially for low-wage workers and those with pre-existing conditions. ACA detractors point to design flaws that have discouraged relatively healthy people from enrolling and have led insurers to depart the program. The taxes required by the ACA have alternatively been praised for reducing income inequality and vilified for stifling small businesses. Broader debate over the wisdom of private-sector and public-sector solutions is more divided than ever. The new U.S. Congress has made revising or repealing the ACA its first order of economic business. Leadership hopes to have a measure ready for the president’s signature within his first 100 days in office. But whatever one thinks of the ACA, unwinding it is no simple task. For starters, there are about 20 million people who have coverage today under the ACA. Some transition from their current plans to something else will be required, but designing and implementing a new system will certainly take longer than a few weeks. So, the legacy of ACA costs is likely to persist for a time. To pay for expanded coverage, the ACA introduced additional taxes and fees on insurance carriers, firms and individuals. Many in Congress would like to provide immediate relief from these costs, but the loss of revenue without the elimination of expense would leave a dent in the Federal Budget. Further, the non-partisan Committee for a Responsible Federal Budget reported this month that ACA repeal could hasten the insolvency of Medicare. The ACA debate will be a benchmark for others that follow. Legislators are being forced to reconcile some of their policy aspirations with the hard realities of budget math. The medical profession and the markets will be paying close attention. The iShares FTSE/Xinhua China 25 Index ETF (NYSE:FXI) closed at $36.57 on Friday, up $0.08 (+0.22%). Year-to-date, the largest China-focused ETF by assets has gained 5.36%, versus a 1.57% rise in the benchmark S&P 500 index during the same period. FXI currently has an ETF Daily News SMART Grade of A (Strong Buy), and is ranked #1 of 32 ETFs in the China Equities ETFs category. This article is brought to you courtesy of Northern Trust.